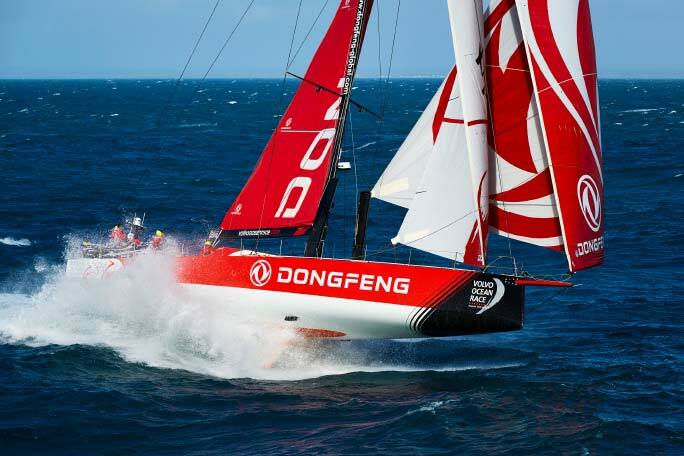 Vestas 11th Hour Racing and Dongfeng Race Team traded blows throughout the first half of the Cape Town In-Port Race course on Friday afternoon, before the Chinese-French team grabbed the lead midway through the race and stretched away for their first win in the series. The victory vaults skipper Charles Caudrelier’s team to second place on the leaderboard for the In-Port Race Series, just behind MAPFRE who retained the overall lead with a fightback second place finish on Friday. “The team did a fantastic job, very nice boat handling and good speed, so well done to the full team,” Caudrelier said after the race. Conditions were spectacular on the waters off Cape Town, with wind near 20 knots, under bright, sunny skies. Boat handling was at a premium in the fresh conditions and on the first two laps of the course, there were several very close crosses as the boats approached the turning gates. Near the end of the second run, Vestas 11th Hour Racing were sailing on an awkward wind angle to the mark and had difficulty furling their big A3 downwind sail in preparation for the rounding. It didn’t hurt them immediately but when they next tried to deploy the sail at the final top mark, it wouldn’t fully unfurl, and the team was very slow for most of the final run. The mistake cost the team two places, as both MAPFRE and team AkzoNobel raced past on the run to the finish. The second place finish represented a tremendous comeback for MAPFRE who were forced into a penalty turn just before the start, leaving them them the last to get across the line. But the Spanish team kept pushing its way up the fleet, finally forcing team AkzoNobel away with an aggressive luff near the final top mark, setting the table for the pass of Vestas 11th Hour Racing on the final run. Further back, Brunel and Scallywag engaged in a luffing match early on the first run. The Umpires penalised Scallywag for an infraction and following the penalty turn, David Witt’s team were trailing the fleet.